Oil companies are clamoring to start drilling in Arctic seas, threatening seals' homes and their lives. 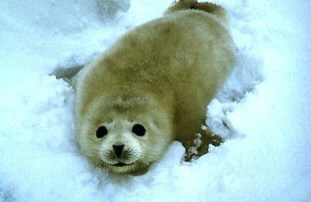 Spilled oil on seals' fur would remove their power of insulation and they could freeze to death. Inhaled oil and toxic fumes could keep seals from breathing properly, leading to painful and slow deaths. Stay up to date with all things Oceana on Facebook, Twitter, and YouTube. Earlier this month, Oregon's governor signed a bill banning all trade, sale, and possession of shark fins in the state. With one less state serving shark fin soup, at-risk sharks now have a better chance at survival. This year crew from our office in Chile sailed to Alexander Selkirk, an island with incredible biodiversity and little protection. The video of our expedition shows that this little-known island is an ocean paradise that needs protected. This summer, Oceana took the Ranger on an expedition to explore seamounts and sea canyons in the Mediterranean and Atlantic. We discovered a deep-sea coral reef, identified carnivorous sponges, and conducted invaluable research in previously unexplored environments. Take Our Seafood Fraud Quiz on Facebook! In honor of our new seafood fraud campaign, we've created a Facebook application to test your seafood smarts. How much do you know about seafood fraud? Use your credit card to save the oceans! Sign up with SwipeGood to round up all of your debit or credit card purchases to the nearest dollar and then donate the difference to Oceana. Text JOIN to 50555 to sign up for Oceana text alerts. Standard message and data rates may apply. This message was sent to lizardmarsh@gmail.com. If you no longer wish to be an Oceana supporter, you can unsubscribe by simply clicking here.